On June 4, 2016, the Feast of the Immaculate Heart of the Virgin Mary, Bishop James Wall ordained seminarian Robert Badger to the priesthood. At the beginning of his homily, Bishop Wall reminded the congregation of the unique role the priesthood plays in the life of the Church. Diocesan priests pray the Litany of Saints as Robert Badger prostrates himself. Self-sacrifice is not a new practice for now-Fr. Robert Badger, who had to give up much that was familiar before achieving ordination. Raised in the Mormon faith, Fr. Badger converted to Catholicism at the age of 19, and later felt the first calling to his vocation while serving Mass in Salt Lake City. Many of his family members are still active Mormons, but Fr. Badger describes them as supportive of his priestly calling. His mother and father, brothers and sisters and other relatives were present at the ordination, and even from a brief glance, it’s easy to see where Fr. Badger gets his engaging and welcoming personality from. Many of the family members readily lined up to receive a blessing from Fr. Badger at the reception after the ordination, and spent much of their time engaging in happy conversation, and even some light teasing and joking with the Catholics in attendance. The next day, Fr. Badger said his first Mass at the Cathedral. At the end, before giving the final blessing, he paused for a moment. Then, thoughtfully and movingly, he spoke of his love for his family. 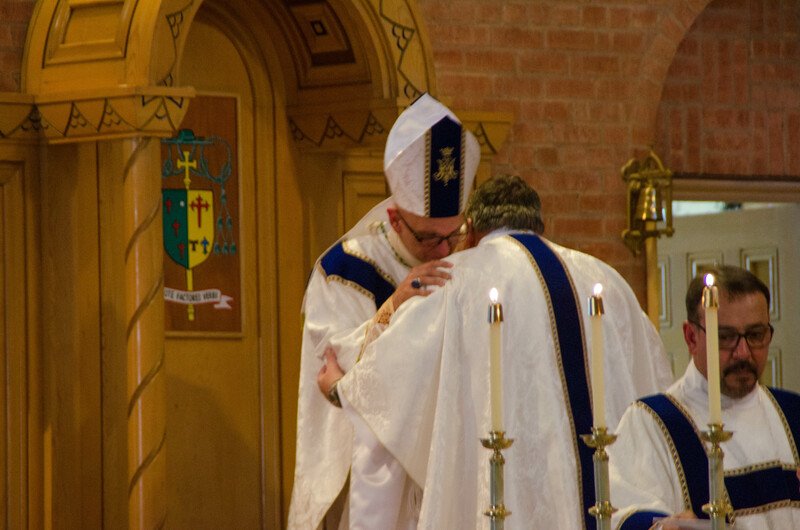 Bishop Wall embraces the newly-ordained priest. 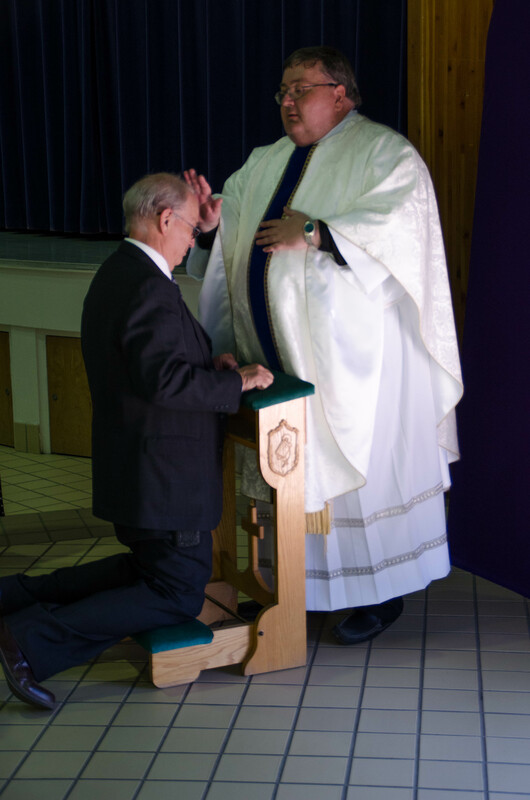 Having served as a deacon for several months prior to his ordination, Fr. Badger was already familiar with the ritual of Mass, but saying Mass for the first time as a priest was a stunning experience, especially when it came to the Eucharistic prayers. Fr. Badger gives a blessing to his father. Fr. Badger now looks forward to serving the people of Grants, NM and its surrounding communities, where he has been placed by Bishop Wall for his first official assignment. This placement will no doubt keep him busy, but in his down time, Fr. Badger says two of his biggest interests are books and music. An organist and pianist, he especially enjoys classical music, and reads lots of history and literature, including books by Sir John Mortimer and J.R.R. Tolkien. And each day, he’ll continue along the same path of self-sacrifice that let him to the priesthood in the first place. During his first homily as a priest, Fr. Badger spoke at length on the unique call that each person receives from God, and asked those present to listen to that call, to fearlessly pursue a loving encounter with Christ. 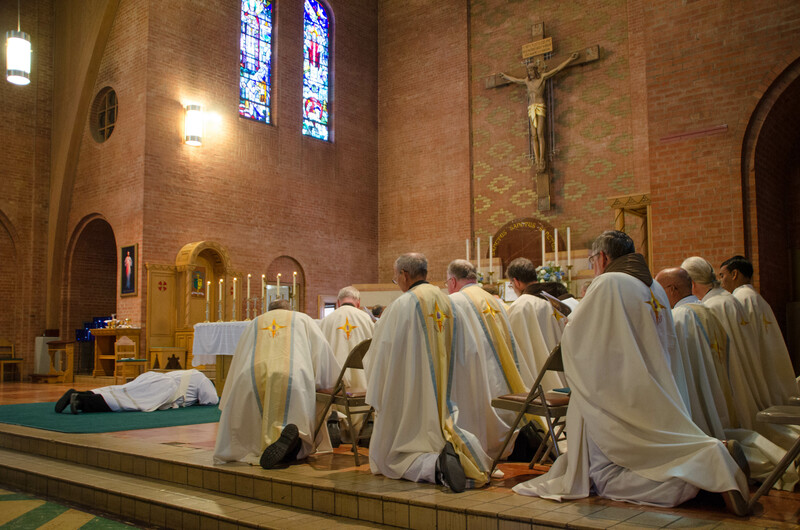 View the full photo album from the ordination here.